In my post last week, I shared information on the Mansfield family. This week I am going to share the extra information I have found for their daughter Catherine’s family. Last week, I hadn’t been able to find the marriage entry for her 2nd marriage. I decided to have a second look at the BDM indexes at https://online.justice.vic.gov.au/bdm/indexsearch.doj and this time found the entry, Catherine Eagar married Benjamin Cross in 1874 (registration number 3311). I have found no children to this 2nd marriage. The other question was, when did William Eagar die? I was hoping that by researching William and Catherine’s children, I would be able to answer that question. William Frederic Eagar born in 1860 at Bacchus Marsh (reg no 1865). There is a death entry for an Elizabeth Lillian Kent who died in 1938 at Yarrawonga, Victoria, aged 72 (indicating a birth year of 1866), with the parents William Eager and Katherine Mansfield. I have not yet been able to find a corresponding birth entry. I did find a marriage entry for Elizth Lillian Edgar to Jas Jno Kent in 1893. Since I haven’t been able to find a corresponding birth entry, I’m not sure yet that Elizabeth belongs to my family. 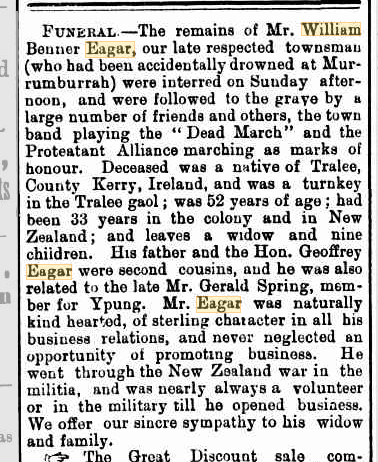 The only record I have been able to find for William Frederic Eagar was a death in New Zealand. So, it was back to looking for William himself. On the birth entry for John Tristan Mansfield Eagar, his father is listed as William Bernard Eagar. I decided to just try the name William Bernard Eagar on Ancestry.com.au and I found a number of records which raised the possibility that William didn’t die, but had deserted Catherine. There is a birth record in New South Wales for a Roland Tollis Eagar, born in 1881 at Murrumburrah, New South Wales. His parents were William Berner Eagar and Mary (reg no 28876). There was a William B Eagar living in New South Wales in 1875. He was a tailor, living at 45 Druitt St.
A William B Eagar died in 1890 at Murruburrah. Australia, New South Wales, New South Wales, Australia, Registers of Coroners’ Inquests, 1821-1937, State Archives NSW; Series: 2925; Item: 4/6619; Roll: 343, entry for William Benner Eager, 13 Aug 1890; digital images, Ancestry.com Operations INc, Ancestry.com (http://home.ancestry.com.au/ : accessed 4 May 2016). The age and birthplace correspond with the information we know about the William Eagar who married Catherine Mansfield, but I still need more information to know if this is the same person. His funeral notice does seem to indicate this is the same person, as it mentions his birthplace as Tralee, Kerry, Ireland. FUNERAL – The remains of Mr. William Benner Eagar, our late respected townsman (who had been accidentally drowned at Murrumburrah) were interred on Sunday afternoon, and were followed to the grave by a large number of friends and others, the town band playing the “Dead March” and the Protestant Alliance marching as marks of honour. Deceased was a native of Tralee, County Kerry, Ireland, and was a turnkey in the Tralee gaol; was 52 years of age; had been 33 years in the colony and in New Zealand; and leaves a widow and nine children. His father and the Hon. Geoffrey Eagar were second cousins, and he was also related to the late Mr. Gerald Spring, member for Young. Mr. Eagar was naturally kind hearted, of sterling character in all his business relations, and never neglected an opportunity of promoting business. He went through the New Zealand war in the militia, and was nearly always a volunteer or in the military till he opened business. We offer our sincere sympathy to his widow and family. This article mentioned he was a turnkey in the Tralee gaol, so I went back to William and Catherine’s marriage certificate, to see what his occupation was. The marriage certificate showed his occupation was gaol guard. It seems unlikely that there were two William Eagar’s born about the same time in Tralee, who were both working at the Tralee gaol, so this does seem to be proof that Catherine wasn’t actually a widow when she married Benjamin Cross, but that her husband had left her. The following are the children found for William on the NSW BDM website. There is another entry in New South Wales that may be another child of William’s. Although the town and mother’s name are different, Murrumburrah and Yass are close to each other. There is also no evidence that there was another William Eagar living in New South Wales at the time. The New Zealand records show that William and Mary had four children before moving to New South Wales. I have been unable to find a marriage record for William and Mary. It is quite possible that they never married. Now that I have found out what happened to William, it is time to turn back to Catherine’s children. The first child, John, had died. I have been unable to find any trace, other than the birth, of William Frederick Eagar, who was born in 1860 at Bacchus Marsh. Locating records for him is further complicated by the fact that William had another son, born in 1864 in New Zealand, that he also called William Frederick Eagar. This would indicate that the William Frederick Eagar who was born in 1860 died young. Since Catherine’s two sons appear to have died young, that leaves me with Elizabeth Lillian Kent, nee Eagar. Eliza Lillian Eagar, christening date 06 Jul 1893 Heidelberg, Victoria, Australia, birthdate 25 Dec 1892, father William Eagar, mother Catherine Mansfield. This is the same year that Elizabeth Lillian Edgar married James John Kent. Did she get baptised in order to get married? I decided to get Elizabeth and James’ marriage certificate to confirm firstly that Elizabeth was the daughter of William Eagar and Catherine Mansfield, and to find out the date and place of the marriage. Elizabeth Lillian Eagar, spinster, birthplace Bacchus Marsh Vic profession lady age 26 residence Templestowe, father William Eagar, tailor, mother Catherine Mansfield married John James Kent on 10th July 1893 at St John’s Heidelberg. The minister was RC (Roman Catholic). One of the witnesses was Gladys Eagar. This certificate confirms that she was the daughter of our Catherine Mansfield. Based on her age, she was born about 1867. This raises the question as to whether William was her father, as he was in New Zealand by 1864, or if she was older than indicated. If he wasn’t the father, it may explain why no birth record has been found for her. The baptism record above was only 4 days before Elizabeth’s marriage, and the location of the marriage matches the baptism record, so it appears that Elizabeth hadn’t been baptised earlier, which would also make sense if William wasn’t her father. The baptism record will need to be checked, in order to verify the date of birth listed. Next week, I will be sharing what I have been able to find out about Catherine Mansfield’s sister Mary Ann Mansfield, who married John Farmer.